Grand Champion ETA Tim E Hendry in the final moment of his winning performance at the Collingwood Elvis Festival 2018. Photo Credit: Lori-Anne Crewe, LA Crewe Photography. After years of thinking, “I really should go,” I finally attended my first ever Collingwood Elvis Festival this past July. I had heard stories from fans and family about their experiences at the festival, and they made the event sound very exciting. But until you are actually there in person, you don’t appreciate what a fantastic weekend is in store for you. I hope the telling of my experiences will inspire readers who are yet to attend the Festival to make their first trip to Collingwood in 2019 for the 25th anniversary celebration. It is sure to be a smashing weekend. I also hope my writing stirs up fond memories for festival faithfuls, and maybe amuses the few who still wonder what the fuss is all about. I remember the good old days when travelling North meant taking the hilly, two-lane Hwy 27 that made riding in the backseat of my dad’s big old gas guzzling Chrysler, untethered by a seatbelt, seem like a wild roller coaster ride. In later years, Hwy 400 offered a nice trip north once you were clear of Toronto. But for me, in 2018, driving in bumper to bumper traffic on the 400 without air conditioning in the middle of summer sounded like a nightmare. I opted to take the leisurely back road route using my CAA trip trek as my only source for direction (I do not have GPS or a cellphone). Holding the mapped-out instructions in one hand and checking the odometer to see how many km I had to travel before my next turn, I managed the 2hr 15min trip from my home to Collingwood, making only one slight error when I missed the turn that was a mere 360 metres from the gas station driveway. To demonstrate how really countrified the route was that I took, I need only mention to fellow Ontarians that I passed just one Tim Horton’s on the way. Even in February, 2018, finding suitable accommodation in Collingwood and the surrounding area during Elvis weekend was proving to be a nightmare. Lori-Anne Crewe, SIDEBURNS photographer and web manager, was looking after bookings for both of us, and it was nearly impossible to find an ideal place with two beds that we could share. Lori-Anne found two separate places on Airbnb that sounded promising. My accommodation was 20 minutes outside Collingwood, and Lori-Anne found a basement B&B within town limits which was suitable for her because it would provide storage and convenient access to her camera equipment for the three days we attended the Elvis Festival. The sitting room at Robbi and Lou’s B&B in Collingwood. Photo Credit: C. MacArthur, for SIDEBURNS Magazine. We were travelling from different directions, so we arranged to meet at my B&B situated on the very scenic Road 119. After driving past the house, which did not look at all like the photo on Airbnb because it was getting a facelift, I found Lori-Anne waiting in her car. Robbi, owner and hostess, whose husband, Lou, was busily working on the installation of the newly painted batten board, greeted me at the door. Robbi took me upstairs to my “suite” that contained a bedroom, a separate sitting room that was equipped with small kitchen appliances, a TV, table and chairs, and a couch, and a private bath. The entire area was painted shades of light grey, with one wall covered in modern grey and silver wallpaper. The wooden floors, that were painted white, added freshness to the suite. The attention to detail in decorating and the quality of the materials used in Robbi and Lou’s B&B have earned this couple glowing comments from their guests. After a long day of making the rounds in Collingwood, the light refreshments that Robbi laid out in the sitting room were much appreciated. I enjoyed my stay so much, I am thinking of returning in the autumn for a relaxing, non-working stay. The calm and comfortable bedroom at Robbi and Lou’s B&B offered a nice retreat after a busy day. Photo Credit: C. MacArthur, for SIDEBURNS Magazine. I was concerned when Lori-Anne said she was staying in a basement B&B in town, as I wondered whether it could possibly be as nice as mine was in the country setting. I did not need to worry. Lori-Anne’s B&B had a private side entrance, and down a mere three steps (I had to enter my suite through the living room and up a flight of stairs), we found a beautifully decorated private apartment that had a separate bedroom and bath, a sitting area with a couch, a fireplace, TV, and an eating area. We were both very pleased with our accommodations. I would highly recommend either B&B to potential guests, and most certainly to first time visitors to Collingwood who wonder about accommodations outside “The Village”. After we settled in our respective accommodations, we made our way into the town of Collingwood. The last time I was in Collingwood was over thirty years ago, before the Elvis Festival existed. I remember bringing home a gift of Blue Mountain pottery to my mom. It was the outdoor areas that held interest for me in those days, and I remember the town as being quaint. A lot has happened over the years, and Collingwood has grown into quite the tourist, residential, and retirement destination. It still has the natural beauty that first attracted me, but it seems more polished than I remember. We didn’t have much time to sightsee as we were instructed to pick up our media passes between certain hours. At the library we found that the location for pick-up was a trailer behind the main stage. Fortunately, once downtown, everything we needed was within walking distance. ETA James Gibb. Photo Credit: C. MacArthur. for SIDEBURNS Magazine. It was very exciting to hear our first ETA of the day singing as we rounded the corner where a secondary stage was set up. I thought as I got nearer to the stage that whoever was singing was fantastic, and when I saw it was ETA James Gibb, I was delighted. I have enjoyed so many of James’s shows at Flamboro and Mohawk this past year, and here he was, dressed in his maroon velvet shirt and black pants entertaining as only he can. The street scene taken from the main stage. Photo Credit: C. MacArthur, for SIDEBURNS Magazine. The plan for Lori-Anne and me on Friday was to get our bearings. It was, after all, our first time at the festival, and although we mapped out whom and what we planned on covering, we knew that even the best laid plans can go awry. As we neared the main stage, the number of fans on lawn and camp chairs between the sidewalks on the closed street was astonishing. I wondered how long those in the front row had to sit waiting for the first ETA performance. Just in front of the stage is an area set aside for those with special needs, and to the left was the judges’ area. The sidewalks were filled with people who stood to watch their favourite ETAs. As we rounded the corner behind the stage on our way to the trailer, we were met with an unbelievable visual. ETAs—more than I ever could have imagined—were gathered in one relatively small area freely mingling with fans. As a first time visitor to the Festival, I was gobsmacked. I was not expecting to see so many ETAs all at once. Some I knew from shows, and some were new to me, pros and non-pros alike. They were signing autographs and taking photos with appreciative fans. My friend, and ETA fan, Dot Farr, who has been to the Festival many times, told me that I would see and meet a lot of ETAs behind the main stage after they finished their performances; but in my mind I pictured a much different scenario of how it all would take place. I was expecting to see one individual performer at a time making their way through the crowd of people, shaking hands, signing autographs, and posing for an occasional photo, much like an actor does when he/she exits the Stage Door after a play. Instead, we were bombarded with images and sounds, so many, many ETAs, and loads of fans. Quickly we got out our cameras and started snapping photos. Lori-Anne focused mostly on the ETAs, while I concentrated on the fans. It was a photographer’s dream setting. It was so much fun and we wanted to linger longer, but we needed to pick up our media passes by a certain time. Directly behind the stage, and just before the meet and greet area, there was a designated area where the ETAs could take a moment gather their thoughts or enjoy light refreshments before they performed or competed. Our media passes allowed us entrance into this secured area. I was able to talk to some of the ETAs while Lori-Anne made use of closer access stage to take amazing action photos. Ultimate ETA Gordon Hendricks looked so cool on a hot summer day. Photo Credit: C. MacArthur, for SIDEBURNS Magazine. I had a nice chat with Ultimate ETA Gordon Hendricks, who very kindly mentioned how much he enjoyed the interview I did with him that is posted on SIDEBURNS. I asked about his album and tour of “Stripped Back” that is going extremely well in sales and in performance. It was nice seeing his road manager, Dave, and his wife, Linda, who sat in on Gordon’s interview. I also spoke to Dean Z, whom I first met at the Niagara Falls Elvis Festival in April. At the time, we discussed Dean doing an interview, but those who follow Dean know that he lost his father not too long ago, and in his own words can only, for now, focus on what he does on stage, his wife, his family, and close friends. My deepest sympathy goes to Dean who, as a performer, must carry on with a very heavy heart. Editor Carolyn MacArthur and the incomparable Ultimate ETA Dean Z. Photo Credit: C. MacArthur, for SIDEBURNS Magazine. Since it was my first time at the Collingwood Elvis Festival, I was excited to meet the competitors and past winners, who, although new to me, are well-known to dedicated ETA fans and festival goers. As I introduced myself, I was quite surprised, and very pleased, at how many ETAs had already heard of SIDEBURNS Magazine. (Thank you to followers of SB who are spreading the word!) Those who were hearing about my ETA fan magazine for the first time were very interested in learning about what we cover. From these positive conversations, I am confident that their interest will ensure interesting bios and interviews to post in the coming months. If I had to do the weekend over again, I would have stayed for four nights, not two. It was a learning experience, for sure. In a festival so rich with choices, we had to make a decision to focus on the pro and non-pro competitions, first and foremost, at the main venue. We saw some outstanding performances at the Eddie Bush Arena over the three days. ETA Peter Doiron in his winning performance. Photo Credit: Lori-Anne Crewe, LA Crewe Photography, for SIDEBURNS Magazine. ETA Ken Patterson. Photo Credit: Louis Young, Louis Young Photography. Peter Doiron: I first had the pleasure of meeting Peter when he competed in the Niagara Falls Elvis Festival in April, 2018. For his performance in the Collingwood Elvis Festival competition, Peter wore a crisp, white jumpsuit. Peter is a kindergarten teacher in London, Ontario, and from the moment he stepped on the stage, it was apparent he had done his homework :). Peter will be returning to his classroom this school year with a first place trophy to show his students. Congratulations on a well-deserved win, Peter! Ken Patterson: More than one great ETA calls Milton, Ontario home. It was the first time I have seen Ken perform, but it was his sixth year at the Festival. An ETA performer for sixteen years, Ken first became a fan at age six when he heard “Teddy Bear” on the radio. Ken’s favourite Elvis song is “Stranger in the Crowd”, which he sang during the competition, along with “Sweet Caroline”. ETA Joe Zambri. Photo Credit: Louis Young: Louis Young Photography. Joe Zambri: From Toronto, Ontario, Joe Zambri, a twenty year veteran ETA, was performing for the fourth time at the Collingwood Elvis Festival. Emcee Brent Freeman, in his introduction of Joe, noted that Joe has a 5th degree black belt in karate. Black seems to be his colour of choice, as he wore the striking black pinwheel jumpsuit for his time on stage. Joe’s favourite Elvis song is “Can’t Help Falling in Love” from the movie “Blue Hawaii”. ETA Spencer Bristow . Photo Credit: Lori-Anne Crewe, LA Crewe Photography, for SIDEBURNS Magazine. Spencer Bristow: Appropriately dressed, and looking smashing in army fatigues, Spencer sang “Shop Around” and “Soldier Boy” in the early round of competition. From Durham, Ontario, this year marks Spencer’s eighteenth year performing at the Festival. In the final round of competition, Spencer wore the iconic gold jacket with sparkly trim, that perfectly matched his sparkling performance. His first interest in Elvis came when he heard Elvis CDs at home, and would then sing along in the car. Spencer placed third in the top five of the competition. Congratulations, Spencer! ETA Dennis Bushell. Photo Credit: Louis Young, Louis Young Photography. Dennis Bushell: Dressed in a white jumpsuit with red trim, Dennis Bushell from Walkerton, Ontario, was all set to perform for the tenth year in the Festival. An ETA for ten years, Dennis shares that his first memory of Elvis was watching “Blue Hawaii” on TV. Dennis’s favourite song is “Can’t Help Falling in Love” from the movie “Blue Hawaii”. ETA Berry Chumbley. Photo Credit: Lori-Anne Crewe, LA Crewe Photography, for SIDEBURNS Magazine. Berry Chumbley: Berry Chumbley, dressed in a blue jumpsuit and a matching blue cape with silver lining, gave a great performance of his favourite song, “American Trilogy”. Berry, from Corbyville, Ontario, has been an Elvis Tribute Artist for five years. He admires the diversity and versatility in Elvis’s music. Congratulations, Berry, in coming fifth in the Non-Pro Division. Well done! ETA Gordie McNeil. Photo Credit: Lori-Anne Crewe, LA Crewe Photography, for SIDEBURNS Magazine. Gordie McNeil: I have seen Gordie perform in shows this past year, but Collingwood is the first time I have seen him in competition. This year is his eighth year performing at the Festival. He recently finished first in the Senior Open division at the Rock and Roll Remembered competition in Oshawa. Gordie dedicated “Any Way You Want Me” to his wife, Lynn, who was celebrating her birthday. Congratulations on winning first place at the Oshawa competition, Gordie! ETA Sam Calari. Photo Credit: Lori-Anne Crewe, LA Crewe Photography, for SIDEBURNS Magazine. Sam Calari: Sam Calari announced that he was wearing a copy of the same white and gold jumpsuit that Elvis wore in his 1977 concert when he sang “Hurt”. It is a big song, but as an award-winning ETA for ten years, Sam was up to the task. Sam has been a finalist in many contests. ETA Frank Di Rienzo, Frank D. Photo Credit: Lori-Anne Crewe, LA Crewe Photography, for SIDEBURNS Magazine. Frank Di Rienzo: Also known as Frank D, Frank Di Rienzo has an unmistakable stage presence. Dressed in a green jacket with a black shirt and black pants, Frank looked every bit “The King of the Whole Wide World”. In a lovely moment after the competition was over, we caught up with Frank having a much deserved drink outside a local establishment to celebrate his fourth place in the top five. Well done, Frank! ETA Jim Robinson. Photo Credit: Lori-Anne Crewe, LA Crewe Photography, for SIDEBURNS Magazine. Jim Robinson: I met Jim in the Collingwood library parking lot. He was my first ETA photo of the day. Jim, from Ajax, Ontario, sang “Bridge over Troubled Water” for his mom. In a November 26th, 2013 article in DurhamRegion.com, Jim is quoted as saying, "I have been an Elvis tribute artist for seven years…I have performed in Windsor, Kitchener, Collingwood and Montreal, to name a few…We have a great show …which helps our local charities. It's like a melting pot; we have a good time and meet up with charities…like Dreams and Wishes. All the proceeds go to the charities to help them survive or grow." ETA Bill Gallant. Photo Credit: Lori-Anne Crewe, LA Crewe Photography, for SIDEBURNS Magazine. Bill Gallant: I had the pleasure of meeting ETA Bill Gallant from Angus, Ontario, and his son Aaron, who is an ETA in the Youth category, and taking a couple of photos. This is Bill’s twenty-first consecutive year of performing at the Festival, and marks his 21st year as an ETA. Bill has won numerous awards, including the 2013 Paco Danesi Award. Emcee Brent Freeman said in Bill’s introduction that Bill’s daughter is also a performer…a very talented family. ETA Marnie Lee Mackintosh. Photo Credit: Lori-Anne Crewe, LA Crewe Photography, for SIDEBURNS Magazine. Marnie Lee Mackintosh: We met Marnie for the first time at Flaming Star Festival last October and were instantly struck by her dedication to performing a true tribute to Elvis. At Collingwood, Marnie, dressed in a striking gold suit, gave a polished and confident performance. Marnie saw her two passions, Elvis Presley and hockey, come together in May, 2018 in a song she co-wrote and performed, “Let’s Beat Las Vegas”. The song won CBC Manitoba’s Information channel competition. ETA Dennis Chambers. Photo Credit: Lori-Anne Crewe, LA Crewe Photography, for SIDEBURNS Magazine. Dennis Chambers: In his fifth year of competition, Dennis Chambers from Kitchener, Ontario gave an outstanding performance that earned him a second place finish in the competition. It must have been a thrill to perform his personal favourite song, “My Way”. 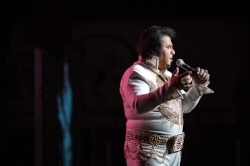 Dennis is quoted in the program as saying that he cannot think of an entertainer more deserving than Elvis to tribute, and Dennis performed a great tribute. Congratulations, Dennis! ETA Gordon Baird. Photo Credit: Louis Young, Louis Young Photography. Gordon Baird: Gordon is from Thornbury, Ontario. This year marked his fourteenth year performing at the Festival. Gordon has been an Elvis Tribute Artists for 14 years. He loves seeing all the fans who attend each year to keep the legend of the King alive. ETA Mark Craig. Photo Credit: Lori-Anne Crewe, LA Crewe Photography, for SIDEBURNS Magazine. 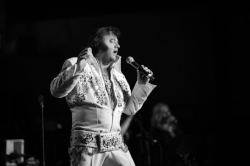 Mark Craig: Originally from Collingwood, now residing in Midland, Ontario, Mark Craig was performing his 10th year at the Collingwood Elvis Festival. Mark shared in the program bio that his mother loved Elvis and favourite memory is of Elvis’s Christmas Albums. Looking great in his pink sport jacket, Mark gave an energetic performance that was captured by Lori-Anne in the photo on the left. There you have it: your top 15 competitors who made it to the second round of competition. Well done everyone! A hearty congratulations to the to the top five. Your performances were stellar! We tried to get photos of everyone, but sometimes it just isn’t possible. Below, are a few of my own photos that were taken before and after performances. Special thanks to photographers Lori-Anne Crewe, LA Crewe Photography, and Louis Young, Louis Young Photography, for the amazing images they captured at Collingwood that appear in this post for your enjoyment. Please be advised that the photos are the property of the photographers and are therefore protected by copyright. If you wish to purchase the photos, please contact the individual photographer.